Join us this Thursday, September 19, at 12:30 p.m. for our regular Third Thursday Demo. This month, we're focusing on accuracy. Cyndi, Cindy, and Karen will offer many tips and demonstrate techniques on measuring, cutting, marking, stitching, and pressing that you can use to ensure satisfaction with your projects. Don't miss this informative demo day! Bring your lunch if you'd like, and your sewing machine if you'd like to stay after the demo to sew. No reservation needed. Demo Day events are always free. New fabric . . . and much more on the way! This bold collection just arrived. We'll have a sample quilt made from it up in the shop soon. We had a flurry of fabric reps visiting last week and ordered lots and lots (and lots!) of new fabric that will trickle in over the coming weeks and months. 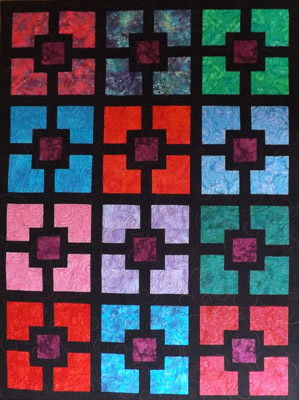 Make this bold, beautiful jewel-tone quilt using an Eleanor Burns pattern called Hole in the Wall. The blocks are large and the top goes together very quickly. Finished size is 56″ x 68″ (nice sized throw) and the kit includes everything except the backing fabric. Order securely online or purchase in the shop where you can also see the sample. We have other kits available online and more will be added soon. Check them out here. Free shipping on orders over $100. All of our online kits are also available at the shop. Have you been thinking about purchasing one of our Tailormade sewing or cutting tables? Well, now is your chance to save. Buy the Quilter’s Vision or Eclipse model sewing table or a cutting table and get FREE shipping PLUS a $50 gift certificate from CQC. Buy two pieces and get a $100 gift certificate! Click here for more details on all of the Tailormade pieces or stop by the shop to pick up a brochure. May not be combined with other special offers or discounts. No frequent shopper points on furniture. This offer good through the end of September, 2013 ONLY. 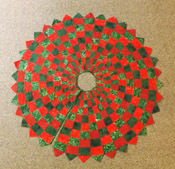 Use the Cheryl Phillips 10 degree wedge ruler to make this beautiful bargello Christmas tree skirt using only four fabrics. Finished size is 42″ in diameter. Cindy Dahl will teach this class which is suitable for confident beginners, intermediate, and advanced quilters/sewers. We've added more new classes to the schedule. Click here for more information.